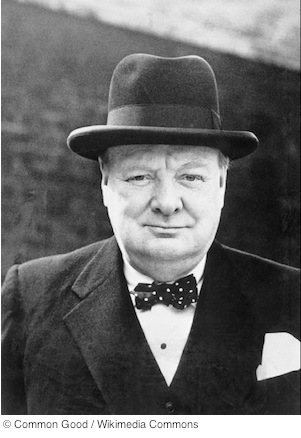 The circumstances surrounding the birth of Sir Winston Leonard Spencer-Churchill read like a Victorian novel, full of intrigue, innuendo, and hints of scandal. His birth on November 30, 1874, was said to be premature but was it really? On his father's side, Churchill descends from a long line of British nobility — the Dukes of Marlborough, a title first bestowed by Queen Anne in 1702. His mother, Jennie Jerome, was an American socialite and heiress said to be one of the most beautiful women of her time. Her father was a speculator in the stock market and part owner of the New York Times. Lord Randolph Churchill proposed to lovely Jennie just three days after meeting her. Their families spent months bickering over the financial arrangements of their union and the couple finally married in April 1874, when Jennie was just 20 years old. Rich American girls such as Jennie who married into European nobility were known in Europe as dollar princesses. The wedding was described as a hushed and rushed affair, lacking in the splendor befitting a privileged young couple of international fame and fortune. The groom's parents, the Duke and Duchess of Marlborough, did not attend. Accounts surrounding the birth of their first child, a son they named Winston, vary but biographies based on family letters indicate the newlyweds were preparing a house in Mayfair, an affluent section of London, for the birth of their first child in January 1875. Meanwhile, they were on retreat at Blenheim Palace, the country house in Oxfordshire that was the official residence of the Dukes of Marlborough. Seven months after the young couple married, Lord Randolph wrote to his mother-in-law that Jennie (now Lady Randolph) had taken a fall during a walk on Tuesday. "A rather imprudent and rough" carriage ride back to the palace brought on the pains of labor the following Saturday night. A ball was in full swing at Blenheim Palace that particular Saturday night. After dancing for a while, labor pains began in earnest for Jennie, who retreated into a small room at the palace where she remained until her son was born at 1:30 AM on Monday morning. Lord Randolph described the event in another letter to Jennie's mother, saying "poor darling" Jennie suffered a good deal but remained very plucky throughout, even foregoing benefit of chloroform. Of his son, Lord Randolph wrote that he was safe, "wonderfully pretty" with dark hair and eyes, and "very healthy considering its prematureness." Children born two months early in 1874 rarely survived. Is Winston Churchill truly a famous preemie or is that a story his family used to distance themselves from a shotgun wedding? Source: "Winston Churchill." History. BBC. n.d. Web. Apr 28, 2014.